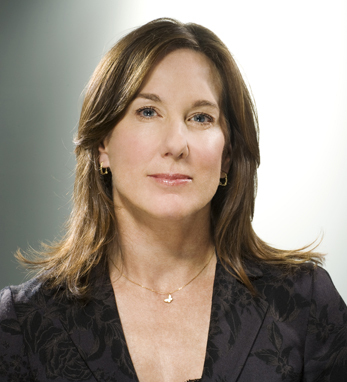 Seven-time Academy Award nominated Kathleen Kennedy, co-chair of Lucasfilm, is one of the most successful and respected producers and executives in the film industry today. Her credits include three of the highest grossing films in motion picture history: E.T. The Extra Terrestrial, Jurassic Park and The Sixth Sense. Her production credits include over 70 films, such as the Indiana Jones series, Schindler’s List, the Bourne Identity series, War Horse and, most recently, Lincoln. Kathleen is the recipient of the Producers Guild of America’s prestigious David O. Selznick Award and is on the board of governors for the Academy of Motion Picture Arts and Sciences. She joined Lucasfilm in June 2012. Kathleen attended San Diego University, where she studied telecommunications and film. A fourth-generation Irish American, Kathleen traces her Irish ancestry through her father, Donald Kennedy. She and her husband, Frank Marshall, have two daughters, Lillian and Megan.